I wrote this talk in 2014, as I was turning 70. What did I know? One thing I know now is that aging is unpredictable and always changing. That shouldn’t be news to a Zen student, but the process aging continually surprises me. On September 6, last year, I turned 73 years old. Sometimes, when I tell people how old I am, they say, “You don’t look 73”. What does that mean? I look older? I don’t think so. I think they mean, “You look younger than 73”. I’ve started to think, “Is that a compliment?”, and if so, why would I, at 73, want to look younger than 73? Why should it somehow be better to look younger than I actually am? Sometimes they say, “You’re not old!” And I say, “Yah, I’m old”. I am of the nature to grow old. There is no way to escape aging. I am of the nature to become sick and disabled. There is no way to escape illness and disability. Or, as Woody Allen says, “Life is full of loneliness and misery and suffering, and over much too quickly”. As teacher Grace Schireson said, “Old age, illness, or death, take your pick”. Well for now, as if I have a choice, I’ll pick old age. As if I had a choice. Buddhists speak of old age, illness, and death as “The Heavenly Messengers”. The legend is told about the prince Siddhartha Gautama that he was raised in complete luxury in a palace, where he was completely protected, pampered, and shielded from all of life’s unpleasantness. But one day, as he was looking over the palace walls, he saw an old person, bent and hobbling in weakness and pain. Then he saw and sick person, overcome by the misery of illness and disability. And then he saw a dead person, pale and shrunken and unmoving. He was deeply shocked, repulsed, and frightened. Having been jarred out of his complacency and pleasure, he then began his search for the answer to the suffering of life. This paradox of finding liberation, and even joy, through turning towards our suffering is at the heart of Buddhist practice, and it is in this way that these dire “messengers” become “heavenly”. Looking back on my life, I see that I was always moving forward into the unknown, even if I had a plan. Things didn’t always turn out according to plan, and as a result, there was suffering. I certainly did not have as part of my “plan”, illness, old age, and death. I was living in a palace of denial, a palace of my own making, a fortress of self-protection, and in my ignorance and fear, it did not occur to me to look further. There’s a difference now, at 73. The palace walls are crumbling. The heavenly messengers approach. I can hear their footsteps. All my life, I have been busy building up the palace walls. I have been building a self, stone by stone: constructing, reinforcing, embellishing, protecting, defending – a self. At times it seemed like a pretty good palace! But the walls are crumbling. Sometimes that scares me, and I race around, trying to repair the damage. Sometimes I feel threatened, and I roll out the cannons. But more and more, I let the walls collapse, and even help them a little, moving stones out of the way, so they won’t fall down and hurt someone. Sometimes I look at one of the walls and realize that I don’t need it anymore, and I gently dismantle it. The palace doesn’t look so good any more — the walls are sagging, the doors are creaky, some of the rooms are empty, some halls lead nowhere. The castle’s getting pretty raggedy. So it seems to me that while the task of younger life is to build the self, the task of maturity is to dismantle it, stone by stone. This is very hard work! The stones are heavy! Some of them are stuck together and hard to move. Some of them have sharp edges. Some of them jump back into place, especially in stormy weather. Sometimes I turn a corner and find a wall that I didn’t even know existed. But as the walls come down, there’s more air, light, room to breathe. I feel freer. Vulnerable, exposed, undefended, but less confined, and softer, more diffuse, more receptive. So even though I can hear the ominous tread of the messengers, I can choose to go down the stairs, and open the door, not try to bar the door and fend them off. Now the fact is that even if I don’t open the door, they will come. And they will get in. I don’t get to choose which messenger comes first. Steve Stuckey, the late abbot of San Francisco Zen Center, didn’t get to choose. He died four months after a surprise diagnosis of pancreatic cancer. My friend Betsy Blossom didn’t get to choose. She dropped dead of a cerebral aneurysm. Most of us would choose old age over cancer or an aneurysm, any day. For me, I knew illness as a young woman, and now I have the privilege of meeting old age. And either old age or illness, or maybe both, will ultimately introduce me to the great Lord Yama, my death. At issue is the complete destruction, the complete annihilation, of my self. The palace will crumble and fall, and become dust. Each of the messengers makes its unique threat to my self-conception. The surgical removal of my breasts and ovaries threatened my very definition of myself as a female. Any illness, temporary or chronic, small or great, takes away illusions of health and ability. Aging chips away at selfhood through loss: loss of youth, attractiveness, and reproductive ability, loss of stamina and robust immunities, loss of hair and skin resilience, loss of sight and hearing, loss of loved ones and friends through death, loss of geographic proximity to children and grandchildren, loss of socially valued work and meaning, and on and on. Each loss unbuilds the palace of selfhood, and there is fear, sadness, and pain. I cannot escape these losses – the suffering of life. And so, with some hesitation and fear, I try to open the door to the messengers, not knowing what to do. Zen practice, and my vows, counsel me to open the door. Pema Chodron quotes her teacher, Chogyam Trungpa, who said, “Hold the sadness and pain of samsara in your heart and at the same time the power and vision of the Great Eastern Sun . . .”. By the Great Eastern Sun, she says, he means “the quality of being continually awake”, of going forward and meeting the messengers. As the teacher Frank Ostaseski says, “Welcome everything; turn away nothing.” Pema goes on, “If you can be willing to feel fully and acknowledge continually your own sadness and the sadness of life, but at the same time not be drowned in it (because you are continually awake), remembering the Great Eastern Sun . . .” you can open the door. Maybe I can greet each messenger with a bow, with some curiosity, stepping beyond the palace gates, into the unknown, where there is something to learn that I don’t already know. So when I go to my half-yearly appointment with my oncologist, holding my fear by the hand, I go forward to meet fully the lab results, the examination for lumps, the medical recommendations, whatever they are, “good” or “bad”. I go forward to meet this encounter and every piece of it as a messenger who will teach me something about what it is to be human. There’s an African proverb: “When death finds you, may it find you alive”. 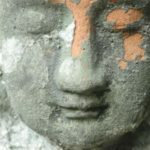 With Zen practice, I have vowed to be awake, to willingly turn towards what is most frightening – what threatens my palace of selfhood most grievously – and to find a stability that does not rest in the self. In seeing my defenses in the minutia of daily life, the minor conflicts and disappointments, I begin to be willing to dismantle them, coming to see them not as barriers, but as doorways to liberation. The myriad threats and losses of life are actually helping me – helping me to find a stability that will not abandon me in the greater losses to come – the stability of vulnerability, fully alive. I have found, in turning towards such losses as I have now, a deepening joy, in the simplest of things, a poignancy in which joy and pain are intermixed. I get to be alive to experience this! As I take each step forward, breath by breath, into the darkness of loss and its completion, and into the light of deepening awareness, there is one more messenger: the monk, serene in the world, like a lotus in muddy water. My practice is my only true belonging. My practice is the ground on which I stand. In 2007, Grace and Peter Schireson took a group of Zen students to Japan for a two-week practice period. We had an opportunity to meet her teacher, Fukushima Roshi, and ask him a question. He was already seriously ill with advanced Parkinson’s, and he was in constant pain. He told us, “This pain is my koan. I look forward to this koan every day”. I asked him, “What is suffering?” He made a joke: “I don’t understand the question, because I don’t suffer”. And then he said, “Mu ga”. “Mu” meaning “emptiness”, “ga” meaning “ego”, or “self” – “No self”. So, the empty self, both self and empty at the same time. He said, “If you can be mu ga, your suffering will end”. Now I turn toward the pain of life as best I can, with such openness as I can muster, as awake as possible, not knowing . . .. And I become able to be present – alive — as a human being, both to myself and to others, bearing the grief and fear and sadness – mine and theirs – with gentleness and clarity, as I am borne. As the walls tumble down, as the door opens, as the messengers arrive, may I be mu ga. May we all be mu ga. May all beings be mu ga.